Founded perhaps as early as the tenth century, Timbuktu is an African city in the modern day nation of Mali. Occupying a strategic location in the Sahara, it served as a convenient meeting place for neighboring civilizations, nomadic Berber and Arab peoples from the north. A premier trading center for West Africa that often attracted European traders, it continues to serve as an entrepot for rock-salt from Taoudenni. Timbuktu was the center of significant written tradition on the African continent, when by the fourteenth century they had established a system for the writing and copying of important books. It is remembered as well for its contributions to Islamic scholarship and is home to the prestigious Qur'anic Sankore University and other madrasas, reminiscent of its heritage as an intellectual and spiritual capital of Islamic West Africa in the fifteenth and sixteenth centuries. Its three great mosques—Djingareyber, Sankore and Sidi Yahya—recall Timbuktu's golden age. The city had acquired a mythical status in the West due to its extensive trade in gold and other commodities; it is still believed by some to be a mythical place, rather than an actual city. 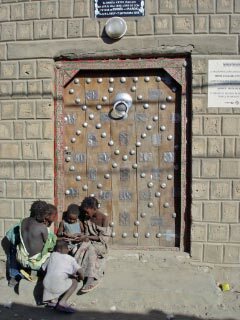 In contemporary times, Timbuktu is populated by Songhai, Tuareg, Fulani, and Mandé people. Timbuktu's historical monuments are being threatened by a process called desertification, wherein the harsh winds off the Sahara drive sand against them. Although continuously restored, the sands continue to wreak a devastating effect; efforts to maintain the monuments have proven ineffectual. A distance sign in the Sahara for caravans. Timbuktu was established by the nomadic Tuareg perhaps as early as the tenth century along the caravan routes that connected the southern coast of West Africa with the trans-Saharan trade. While conveniently located for trade, the geographic location of Timbuktu left it vulnerable to attacks from Tuareg raiders from the Sahara. The constant attacks and threats of invasion prevented Timbuktu from growing into a political center, hindrances that were not shared by neighboring Gao. While Gao grew into a political capital, Timbuktu was never considered safe enough to establish it as a stable community. Over the long history of Timbuktu the geographical weakness of the city led it to be conquered by the Mali Empire, the Songhai Empire, the Tuareg, and the Fulani before being subdued by French colonial invaders in 1893. Like its predecessor, Tiraqqa (a neighboring trading city of the Wangara), Timbuktu became immensely wealthy due to its role in the traffic of gold, ivory, slaves, and salt. These goods originated mainly from the Tuareg, Mandé and Fulani merchants in the north who used Timbuktu as a stepping stone to connect to the southern coast of West Africa. After stopping in Timbuktu and trading with other merchants, traders would transfer their Saharan goods to boats on the Niger River. Eventually these boats were destined for larger ports, including major coastal trading ports where European traders purchased goods to take back to their home countries. Timbuktu's prime trade position made it an obvious target for West African empires seeking to expand their wealth or control over the trade routes. While Timbuktu's history is punctuated by repeated attacks, and it often fell victim to conquering armies, it maintained its position as a trading center despite the political entity that held it in thrall. For example, it retained its status as a key city in the Ghana Empire, the Mali Empire from 1324, and the Songhai Empire from 1468. Under Songhai rule Timbuktu dramatically increased its wealth, and set itself on the road toward reaching its height in the sixteenth century. The eventual decline of the city, while due in some part to its military losses at the hands of Moroccan adventurers in 1591, can be primarily traced to the influx of Portuguese goods into the West African trading system. By choosing to send goods to the Niger River's mouth instead of up the river, Portuguese traders bypassed Timbuktu leading to the deterioration of the city's economic authority. 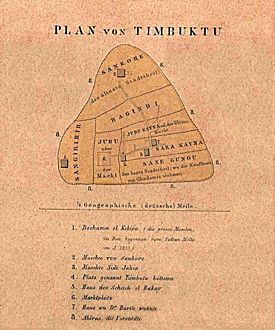 Timbuktu, while a prominent trading center, also gained recognition in the early fifteenth century as a center for intellectual and religious study. The physical history of the intellectual past of Timbuktu is found in the many mosques and other Islamic institutions that can be found throughout the city. The most famous of these is the Sankore Mosque, also known as the University of Sankore. While Islam was the prominent religion in the city, the majority of the rural population were non-Muslim traditionalists. 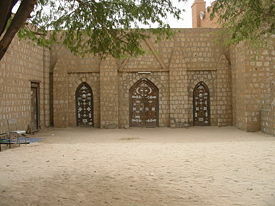 The most prominent of the Islamic institutions of Timbuktu, the University of Sankore, was established in 1581 C.E. Considered Timbukto's center of Islamic study, it was built on the remains of an older site, which archaeologists date to the thirteenth or fourteenth century. It exhibited a dramatically different structure than contemporary European universities and consisted of multiple, entirely independent colleges, as opposed to the European idea of a single college at a university. Students at Sankore dedicated themselves to individualized study under one single teacher, and often attended courses in the open courtyards of mosque complexes or private residences. Due to the religious affiliation of the university, most instruction focused on teaching the Qur'an, although broader instruction in fields such as logic, astronomy, and history also took place. As part of their education, students were expected to write books based upon their research, the profits of which were second only to the gold-salt trade. The most famous scholar of Sankore was Ahmed Baba—a highly distinguished historian frequently quoted in the Tarikh-es-Sudan and other works. The historical importance of Timbuktu was preserved for posterity through a system of libraries that cross the city and West Africa in general. Among the libraries that play a vital role in preserving the history of Timbuktu are: Institute des Hautes Etudes et de Recherche Islamique—Ahmed Baba, Timbuktu, Mamma Haidara Library, Fondo Kati Library, Al-Wangari Library, and Mohamed Tahar Library. Considered part of the African Ink Road that connects West Africa to North Africa and East Africa, these libraries are just a few of the 120 libraries that previously existed in Timbuktu and the surrounding areas. The manuscripts housed in Timbuktu's libraries document all aspects of daily life and cover all aspects of human endeavor. As a historical source, the Timbuktu manuscripts have proven particularly valuable due to their detailed historical documents. Over one million objects have been preserved through the library system, most of which are found in Sokoto, Nigeria. The complete extent of the collections is not known, however, as many documents and artifacts were hidden after colonialists removed complete libraries to Paris, London and other parts of Europe. It is believed that there are still many hidden libraries that have not been discovered. Tales of Timbuktu's fabulous wealth helped prompt European exploration of the west coast of Africa. Exploration of Timbuktu was often motivated by outrageous tales of wealth that glossed over the reality of the city and cemented its reputation as a mythical land of wealth. Among the earliest descriptions of Timbuktu are those of Leo Africanus and Shabeni. Leo Africanus is possibly the most famous author to describe life in the fabled city of Timbuktu. He first came to the city in 1512, while the Songhai Empire was at its peak and exercised control over the city. The rich king of Tombuto hath many plates and sceptres of gold, some whereof weigh 1300 pounds... He hath always 3000 horsemen... (and) a great store of doctors, judges, priests, and other learned men, that are bountifully maintained at the king's expense. Shabeni visited Timbuktu as a 14 year old around 1787 with his father. Raised in Tetuan to become a merchant, he was captured and spent his adult life in England. On the east side of the city of Timbuctoo, there is a large forest, in which are a great many elephants. The timber here is very large. The trees on the outside of the forest are remarkable...they are of such a size that the largest cannot be girded by two men. They bear a kind of berry about the size of a walnut, in clusters consisting of from ten to twenty berries. Shabeeny cannot say what is the extent of this forest, but it is very large. The decline of Timbuktu began with the influx of Portuguese traders, who undercut the importance of Timbuktu on the Niger River by using the mouth of the river as a trading location. The destruction of Timbuktu was cemented with the invasion of Morisco mercenaries armed with European-style guns in the service of the Moroccan sultan in 1591. The military invasion was the final blow to an already deteriorating nation. 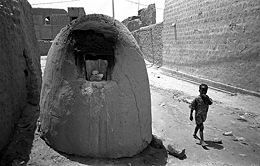 A typical street scene in Timbuktu, with omnipresent bread-baking ovens. 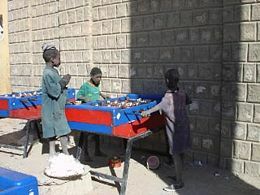 Despite its history of auspicious wealth, modern day Timbuktu is a deeply impoverished city. While the city offers few economic attractions, it still attracts visitors based on its mythical status and fabled existence. The image of the city as mysterious or mythical has survived to the present day in other countries: a poll among young Britons in 2006 found 34 percent did not believe the town existed, while the other 66 percent considered it "a mythical place". 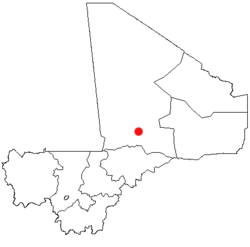 The city continues to face political threats, however, and in the 1990s it came under attack from Tuareg people hoping to build their own state. The Tuareg Rebellion symbolically ended in 1996 with a burning of weapons in the city. Timbuktu is a UNESCO World Heritage Site, listed since 1988. In 1990, it was added to the list of world heritage sites in danger due to the threat of desert sands and desertification. 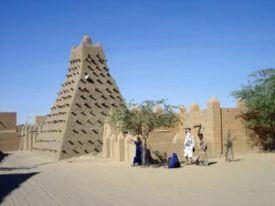 A program was set up to preserve the historical sites of Timbuktu. In 2005, it was taken off the list of endangered sites. 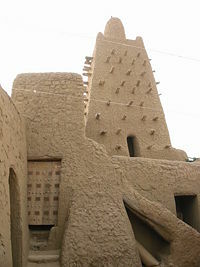 Timbuktu was a major stop on Henry Louis Gates' PBS special "Wonders of the African World." After visiting with the curators of the Mamma Haidara Library and the Cultural Mission of Mali, he was instrumental in obtaining funding (from the Andrew W. Mellon Foundation) to finance the construction of the library's facilities, later inspiring the work of the Timbuktu Manuscripts Project. Timbuktu is home to an institute dedicated to preserving historic documents from the region, in addition to two small museums (one of them the house in which the great German explorer Heinrich Barth spent six months in 1853-54), and the symbolic Flame of Peace monument commemorating the reconciliation between the Tuareg and the government of Mali. Sidi Yahya mosque, built in the 1441 by Mohamed Naddah. Other attractions include a museum, terraced gardens and a water tower. 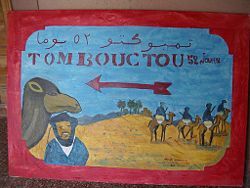 The main language of Timbuktu is Koyra Chiini, a variety of Songhai languages spoken by over 80 percent of its residents. Some smaller population groups speak Hassaniya Arabic and Tamashek. Ali Farka Toure (1939–2006) Born in Timbuktu. Heinrich Barth (1821-1865) German traveler and scholar and the first European to investigate into African history. Bernard Peter de Neumann, GM (1917–1972) "The Man From Timbuctoo." Held prisoner of war there along with other members of the crew of the Criton during 1941-1942. ↑ UNESCO World Heritage Site. Timbuktu Retrieved July 8, 2007. ↑ Jim Mann Taylor, Ibn Battuta and his Saharan Travels, 153 Club. Retrieved July 8, 2007. ↑ BBC News. October 18, 2006. Search on for Timbuktu's twin Retrieved July 8, 2007. ↑ BBC News. March 7, 2006. African star Ali Farka Toure dies Retrieved July 8, 2007. ↑ The Daily Express. February 10, 1943. Front Page: The Man From Timbuctoo. This page was last modified on 9 December 2015, at 17:09.